The scheduled publication date is December 7, 2015, and you can pre-order it on Amazon or Barnes & Noble. During his thirty-plus years of practicing in West Texas and Minnesota, physician and neurologist Tom Hutton discovered that a doctor’s best teachers are often his patients. From these (extra)ordinary individuals, he gained a whole-hearted respect for the resourcefulness, courage, and resilience of the human spirit. 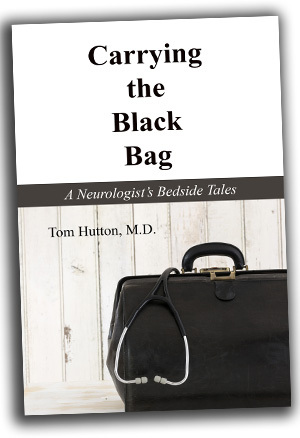 Part memoir and part homage to those patients who faced major illness with grace, grit, and dignity, Carrying the Black Bag invites readers to experience what it is like to be a doctor’s hands, eyes, and heart. Imagine the joy of witnessing a critically ill five-year-old who, against all odds, claws her way back from a coma and near certain death. Meet a lonely Texas widower with Parkinson’s disease who hosts elaborate pinochle parties for a pack of imaginary canines. Step into the surgical booties of the author when he attempts to deliver his own child amid heart-stopping obstetrical complications. Through real-life patient narratives, Hutton shines light on ordinary people facing extraordinary challenges. Moreover, this captivating tale captures the drama of medicine—its mystery, pathos, heroism, sacrifice, and humor. For more than just those working in the healthcare profession, Carrying the Black Bag also shares a behind-the-curtain peek at the rapidly changing American health care system. Other Books By Tom Hutton, M.D. Edited by J. Thomas Hutton, M.D., Ph.D. & Raye Lynne Dippel, Ph.D.
New treatments and advances in therapy for the ravages of Parkinson’s disease are constantly being researched and perfected for patients, yet those afflicted still must endure tremors, poor balance, speech problems, and lessened psychological well-being. Patients and families need the most up-to-date information available to improve quality of care and life. This new, second edition of Caring for the Parkinson Patient covers a variety of topics, providing information and helpful suggestions for patients, families, and caregivers to aid them as they grapple with this chronic, debilitating neurological disorder. Sixteen accessible and information-packed essays by noted contributors address diagnosis and treatment, new research, communication, physical/ occupational therapy, nursing care, problems faced by the caregiver, emotional changes, “neurorehab,” prevention of falls, sleep problems, surgery, community supports, the family, sexuality, and safe home environments. 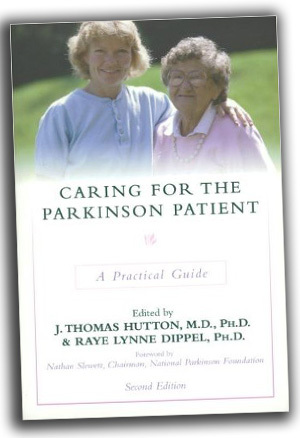 With a wealth of information, practical advice, and encouragement, Caring for the Parkinson Patient is an indispensable resource guide for all those touched by Parkinson’s disease. Millions of people in the United States are now Alzheimer caregivers, but their ranks could double in coming years as the number of older people at risk for developing Alzheimer’s Disease rises drastically. While more research is being done on this disease, new caregivers remain in desperate need of helpful suggestions and emotional support. Caring for the Alzheimer Patient received broad critical acclaim as an important contribution to the limited literature on this devastating disease. The overwhelming support for a third edition indicates the continuing urgent need to deliver important information to countless caregivers, families, and skilled care workers who are indirectly affected by Alzheimer’s. 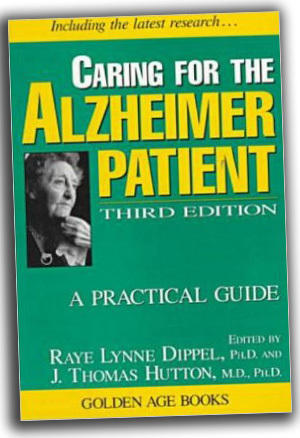 This essential volume, now greatly revised to include the latest research and information on the disease, contains chapters by highly qualified experts on the medical aspects of the dementia caused by Alzheimer’s; optimal living environments for Alzheimer patients; techniques for enhancing memory, orientation, and communication in Alzheimer patients; selecting appropriate nursing homes; the benefits of support groups for Alzheimer families; the reliability of newsmaking research and so-called medical breakthroughs; and more. Edited by J. Thomas Hutton, M.D., Ph.D., Jeffrey W. Elias, Ph.D., JoAnn Leavey Shroyer, Ph.D., and Zane Curry, Ph.D. The risk of serious injury resulting from a fall increases with age as our eyesight, ability to react quickly, memory, and cognitive functions begin to decline. For the growing population of people over age 65, falls can lead to loss of dignity and independence, and they can cause serious injury or even death. Preventing Falls is an essential guide for the elderly, caregivers, Parkinson’s sufferers, and many others who face this health risk in their daily lives. As people age, knowing how to accommodate motor, sensory, and cognitive changes is important. While no single cause for a fall exists, the leading factors are environmental hazards, balance problems, muscle weakness, poor vision, and impaired judgment. Parkinson’s patients as well as those with various neurological or muscular disorders are especially prone to falls because their motor skills are seriously compromised. 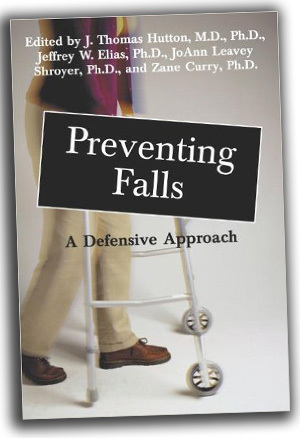 This book addresses valuable skills and coping mechanisms as well as environmental changes and assistive devices that are needed to prevent falls. Many elderly victims of a fall require the skilled care of a nursing home within a year of the incident, especially those elders who cannot care for themselves and whose family members are unable to provide adequate help. The editors place emphasis on “successful aging”-the ability to maintain mobility and remain independent. Preventing Falls is a handy guidebook for elders to decrease their risk of falls, develop personal confidence, and maintain their independence. This vital sourcebook is complemented with a valuable 60-minute videotape offering step-by-step instruction on the best methods for preventing falls.